Blogging is a part of most online business strategies, but sometimes we get into the routine of blogging and we forget that this content is the perfect opportunity to earn more income for our businesses. So here’s your reminder to monetize your blog posts. And yes, you can even go back and monetize posts you’ve already published. How’s your blog traffic? The more traffic you have, the more you can charge for advertising. Choose from the vast assortment of WordPress widgets that make it easy to sell, manage, and position ads. Place them in the middle of your blog content, at the end of the post, or even in the header. You can charge different rates depending on the positioning of the advertisement. Contextual ads are links that are integrated into the text of your blog; think AdSense. Generally, you sign up for a program and agree to allow it to place relevant ads within the body of your blog posts. AdSense isn’t the only option. There are dozens of programs to consider. You may already be using this monetization tactic. The key to success with affiliate marketing is to strategically plan and craft your content. The goal is to promote an affiliate product, not sell it. And the goal for your content needs to be focused on motivating a click. If you have too many goals for your content or the goal is unclear, you may not achieve the desired results. Do you occasionally get asked what blog template you’re running, who your website host is, or what plug-ins you’re using? Create a page that specifically answers those questions. Join the affiliate programs for those services and products and include links to their website sales page. If you’re an online retailer then it makes good sense to use your blog to help generate sales. This is most often achieved by establishing yourself as an expert in your niche. Show people why you’re the person to solve their problems. Provide them with evidence that you’re a credible and trustworthy authority in your niche. Then include a link to a sales page in the call to action. Never assume that the subscription box in your side bar will do the trick in growing your list. If you have a newsletter or opt-in offer that will benefit your reader, include the information right inside the blog post. Most people are too busy to be looking around to see what else is on your site. You have to tell them. So if you’ve been publishing for publishing’s sake and hoping that your readers will find your products or sign up for your mailing list, cut that out! You’ve got to tell what your visitors what to do, why to do it and how to do it. WriterHelpWanted.com co-founders, Ron Douglas and Alice Seba, recently got together to discuss the 5 obstacles that keep most writer from earning a good living from their writing. 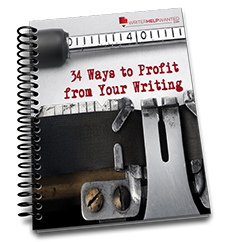 Inside this free video, you'll learn about the 5 obstacles that keep most writers from earning a full-time living from their skills. If you ever procrastinate, doubt your skills or just aren't sure how you can get started, this is for you. To receive instant access, just enter your first name and primary email address below for instant access. We'll also be happy to share even more resources to help you write for a living.